For various reasons, I’ve taken off time from blogging recently. As a result, I’ve fallen behind in letting you know about some of the great reads that have come across my desk in recent months. So for the next few posts I write, I’m going to focus on my recommended summer reading. Starting with The PCOS Diet Plan written by colleague Hillary Wright, MEd, RD, who has a decade of experience helping women with polycystic ovary syndrome (PCOS). Not every woman who comes to Green Mountain struggles with polycystic ovaries, but enough do that makes me think this is an issue that any woman who is struggling with weight ought to at least investigate, especially if they’re also struggling with infertility. Check out whether that’s a possibility for you here: polycystic ovary syndrome. If you decide there is, it’s important to “be fully evaluated by a health-care provider who has considerable PCOS experience,” according to Hillary. She gives a thorough overview of the problem at the beginning of the book as well as what to expect from your doctor as far as testing and help. 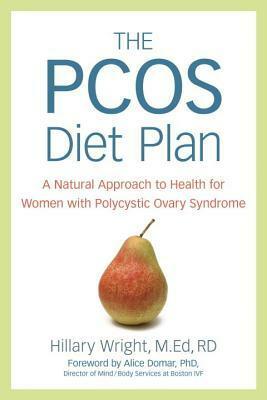 The book provides a wealth of help, though, and it comes in a tidy package of practical advice that “attacks the root cause of the condition — the patient’s inability to process insulin normally…..” I must point out that although it appears the majority are, not every woman who struggles with PCOS is insulin resistant. Still, it’s useful info for the woman with PCOS who isn’t insulin resistant, too. Some of the advice: How to put together an eating plan that works for you, maneuvering the grocery aisles, eating in restaurants, vitamin/mineral/healthy fat supplementation, and much, much more. These topics may not sound that different, but Hillary presents them with the twist that’s important to managing PCOS. Plus, she frequently explains why some of these strategies have a beneficial impact on the problem. Understanding the why can sometimes help us move from a have-to-do-it to a want-to-do-it attitude. The other good news is that Hillary isn’t a fan of diets. So while the book’s title might indicate it’s a diet, it’s not.It’s very much in keeping with our approach at Green Mountain — helping women learn how to eat in a way that truly makes them feel well. And ultimately that’s what’s best at keeping us all doing it. On another note, got anything good planned this weekend? I’m back into kayaking and loving every minute.